23 mm stainless steel case with white ceramic edge band, stainless steel bezel with Bulgari logo, sapphire crystal, white dial, quartz movement, white ceramic bracelet with bangle style medium length, clasp buckle. 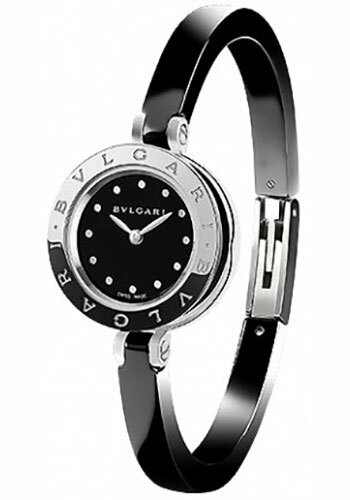 Water resistant to 100 ft.
23 mm stainless steel case, stainless steel bezel with Bulgari logo, sapphire crystal, black dial, quartz movement, black calfskin strap, tang buckle. Water resistant to 100 ft.
23 mm stainless steel case, black dial with dot indexes, quartz movement, stainless steel bracelet with bangle style in medium size, clasp buckle.